Sawgrass is a large sedge plant that thrives on water and can be found on riverbanks in the southern United States, especially in Florida. Scientists consider sawgrass to be one of the oldest plant species, and the plant has tough, edged leaves that can weather year-round flooded conditions of the harsher swamps. Sawgrass is a plant most common along wetlands and made famous for its presence in the Florida Everglades. Its scientific name is Cladium jamaicense, and although it is called a grass, the plant is more technically a sedge. Like other sedges, it has angular leaves instead of the round stems of grasses and prefers moist areas. Although not a grass, the first part of the name "sawgrass" makes sense: It is distinguished by the fine points running along its leaves in a set of sharp teeth. This makes the plant dangerous for people to walk near with bare feet or legs, and boaters in swamps and Everglades learn to recognize sawgrass and avoid the temptation to grab onto it for balance. The plant grows quickly and in dense pockets that have given the expression "river of grass" to some areas of the Everglades. Sawgrass tends to grow higher than grasses, reaching as high as 2.7 meters (9 feet). It produces flowers on spikelike stems that extend up to about a meter (3 feet) high, with tiny flowers dotting the top of the stem. Although sawgrass can be dangerous to human hands, many animals use it as a part of their seasonal cycles. Ducks and geese that migrate through areas of sawgrass eat the nutritious seeds to help gain energy, and other birds use the sedge to protect the outside areas of their nesting sites. Alligators have also been known to nest in sawgrass habitats. 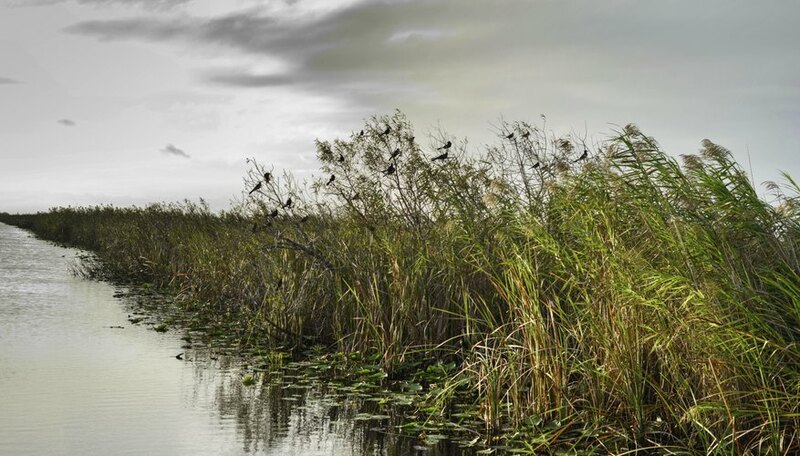 The original location for dense pockets of sawgrass was the northern areas of the Everglades, and today it still grows in the central and southern zones of the Everglades, though the grasses in the northern regions have been cleared for other activities. The grass has spread to riverbanks and swamp areas along the southern United States, from Virginia to Texas. Lacoma, Tyler. "What Is Sawgrass?" Sciencing, https://sciencing.com/sawgrass-5382252.html. 24 April 2017.